Fixed G1 issues of harsh mids. Didn’t lose G1’s bass quality. Waterproof enough for serious workouts. Needs a bit more bass, without EQ. A lot of competition, but will hold its own. Tinkerbell pulls no punches. You mess with Tinkerbell, and there is a very high probability that you will get burned, battered and bruised. You might even say she is Peter Pan’s muscle. You would not be wrong. I like Tinkerbell. When one sees an updated model of a car, you often hear about the “improvements,” which no doubt makes the model better. Take the Porsche 911 for example. From the mid-60’s on to about the early 80’s there was a reputation of going off the road backwards as much as forward if you overcooked a corner. This was due to the rear-weight bias of the engine (and over-exuberant-ill-trained drivers) and as such, one had to relearn how to drive with all that weight hanging over the arse-end. This was no doubt troubling to those who thought they knew how to drive but would sheepishly have to call their insurance company from the resulting wreck. This was a huge appeal as well, because if you could drive a 911 fast, you could drive pretty much anything on the planet, and drive them well. Stories of Porsche’s inhouse test drivers are legendary with regard to their level of skill and speed. I sure wish I had been at the test track in those days. But, from the early 80’s on, Porsche made a concerted effort to “tame” that preponderance for going off tail-first. They did this, because most purchasers of the 911 back in that day were neither that skilled or bragged too much and the result was well…the same. Many a man wanted to “test their mettle” or brag about their “skill.” This was of course often met with increased insurance payments due to the resulting wrecks. 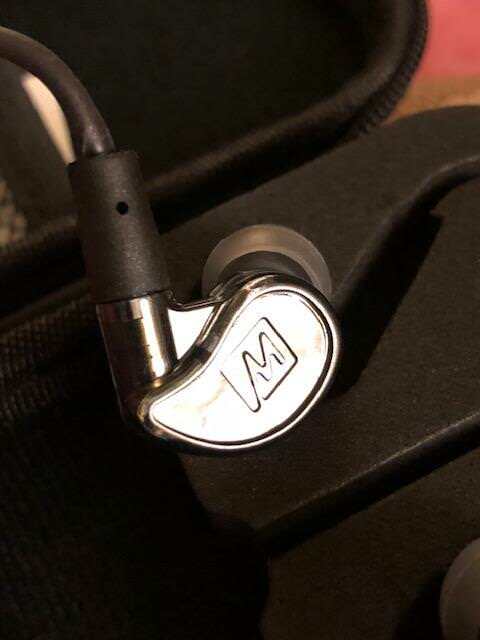 When I approached MEE Audio about reviewing a unit of theirs, Mike immediately hooked on to the fact that I had the 1st Gen M6 Pro. I liked it but noted how it had some issues of which I would like to see addressed (this part was done in my head, lest you think I actually said that to him…). As luck would have it, Mike asked if I was interested in reviewing the 2nd Gen M6 Pro and asked for a comparison between the two Gens. Well of course I jumped at the opportunity, especially after he stated that MEE had smoothed the signature out as well as getting rid of what he called the “splashiness” that the 1st Gen portrayed (THIS was exactly what I was thinking the shortcoming of the 1st Gen was, and he nailed it). I mentioned my thoughts about that splash, and we quickly agreed this would be a good test. So, this would be an example where much like Porsche, MEE tried to “tame the beast” without losing its character. The jury to some old-timers is still out regarding the 911, but as for the 2nd Gen, I can state up front that the changes are for the positive. He also suggested that they would provide the custom plates, which you see attached. I again agreed, and after a couple of emails detailing the design and their tweaking of said design, we agreed (I was giddy to be honest, and over joyed, thrilled, ecstatic, etc…) and in less than two weeks, I had my custom 2nd Gen M6 Pro in hand. Wonderful process, wonderful service. Unfortunately, the M6 Pro G2 (henceforth the M6G2) was behind several in my queue. So, as per my usual, I attached them to the Shanling M1 and Opus #2 and left them. I did pull them out occasionally for comparative purposes with similarly priced critters, and you can read about those findings in my other reviews of similarly priced units. 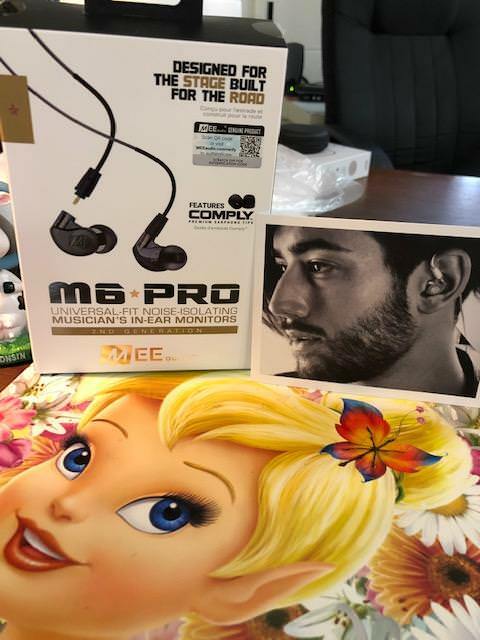 I thank Mike and MEE Audio for their prompt, professional service and willingness to work with me. It has been perfectly professional and nothing but first-class service in the process. Custom plate is a cool idea. MEE graciously made one for me, with a small amount of guidance from yours truly. Actually, all I did was provide a low-res image, which they then cleaned up and reformatted. Like I said, small input from me. Having owned the first gen M6 Pro, MEE wanted me to compare the two, as Mike stated to me they had smoothed the sound out a bit. 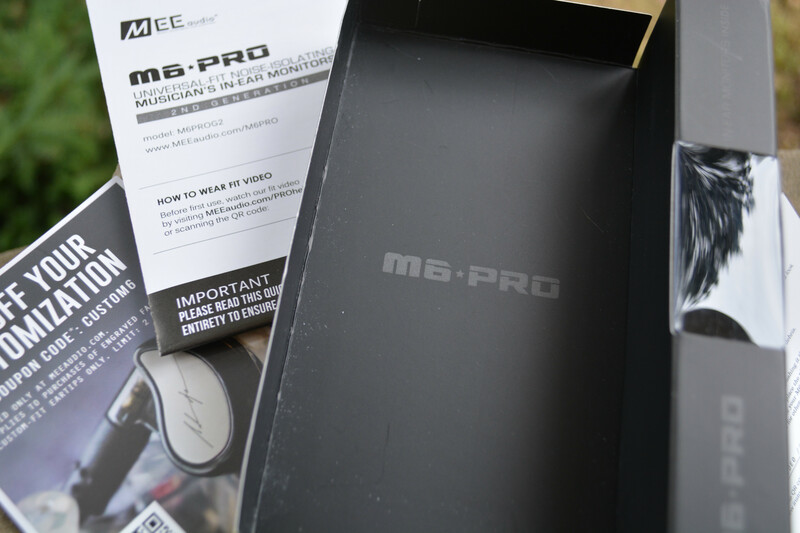 The first gen M6 Pro was my first purchase back into portable head-fi and as such I would use it for working out. The bass was good, not overpowering, but eventually my ears tired from the treble push. It was quite hard, and I would need a break after medium-length sessions. I can state that the second gen M6 Pro does not have that problem at all. After my initial listen, I left the unit running for 1000+hours on my Opus #2/Shanling M1, clearing the queue in front. 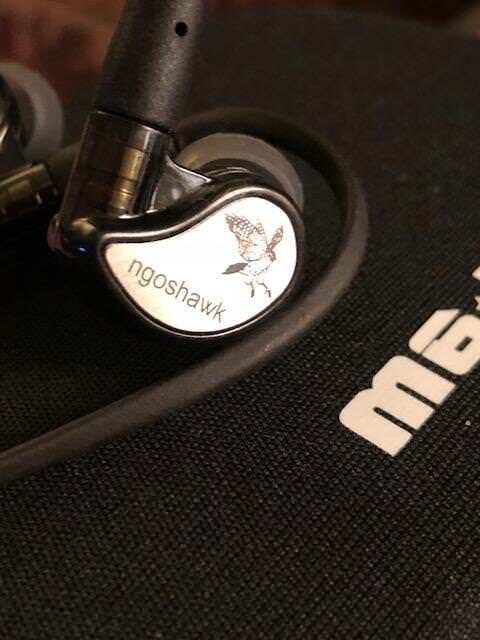 Upon revisiting the M6G2, I was met with solid bass, and tamed highs. I did approve. Using the included Comply’s (my choice of tips), I find that the sound isolates well from outside noise, short of the hacking on my MBP keyboard. I really do not like this keyboard, but that is another story. With two good cables, which are quite flexible and tangle free, you are afforded one regular, and one with mic capabilities. 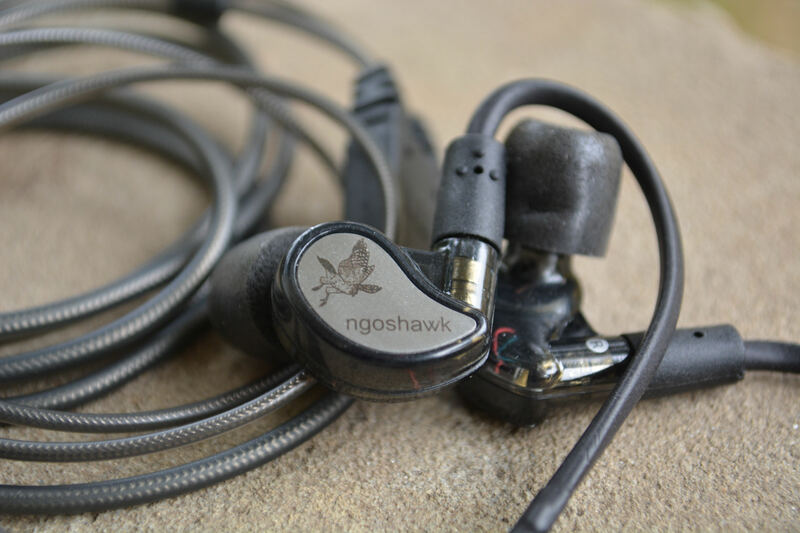 Fit and finish is very good for a plastic-housing sport IEM, and I expected that going in based upon my other MEE Audio offerings of the past. The M6G2 is somewhat source dependent, as running the pair through my Questyle QP2R, I found the bass a bit lacking (less than G1). But when Buffalo Soldier came on, that lack of bass was quickly alleviated. This is very good bass quality. So, in my short revisit, all points move toward improvement upon G1. More later, and so far, so good! 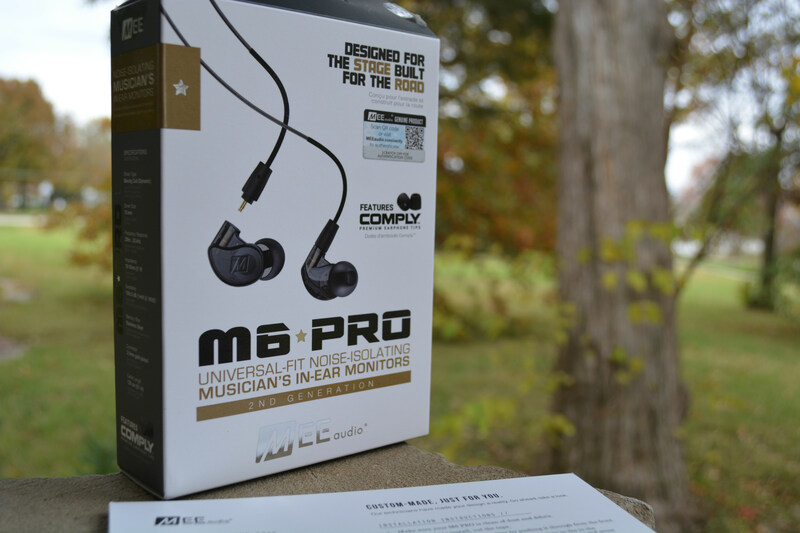 The M6 PRO is covered by a 1-year warranty. If you are not satisfied with your product, contact MEE audio to help resolve your issues. A lifetime warranty program is available for this product (not including engraved faceplates). Visit MEEaudio.com/LRP for more information or to request a replacement. 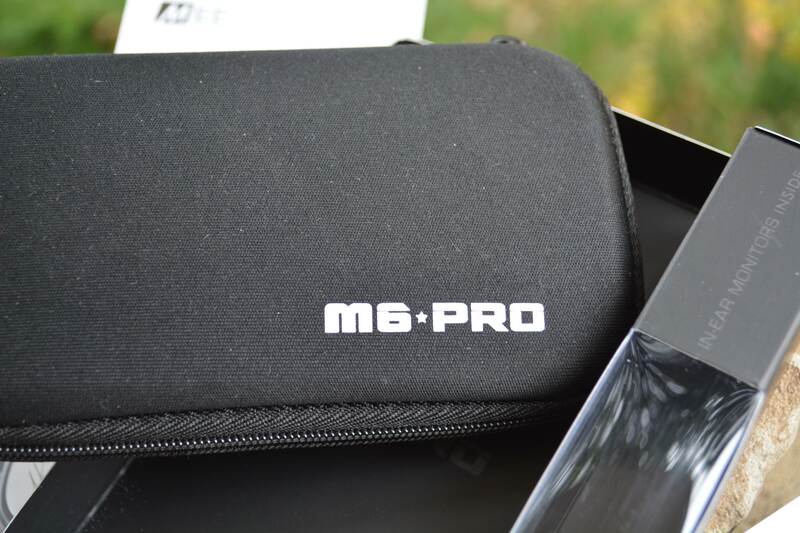 Coming in a fairly small package, the M6 Pro Gen2 (henceforth known as the M6G2), comes with the usual blush of MEE accessories. 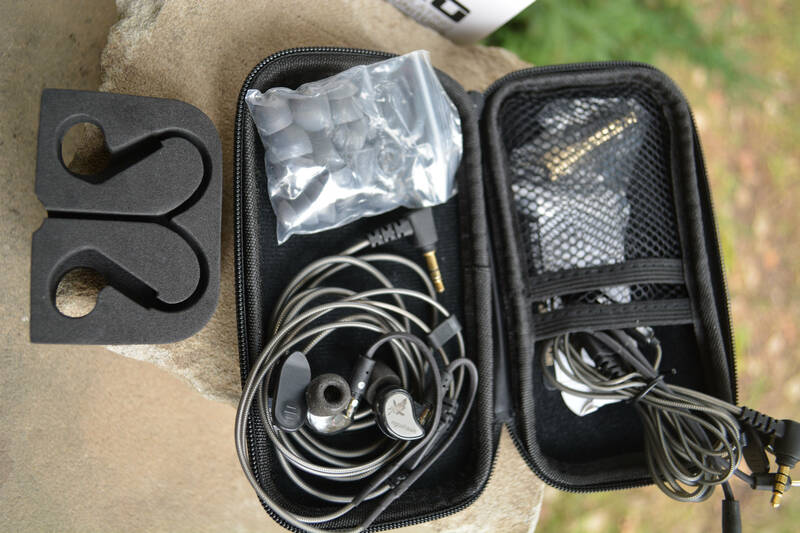 Two cables (one “audiophile/workout” and one with mic for mobile use), a large carrying case (which is roomy enough for both cables and a small portable DAP such as an M0 or R6), Comply memory foam eartips (my personal favorites), Silicone eartips (6 pairs), Shirt clips (2), ¼” adapter, and a user manual. 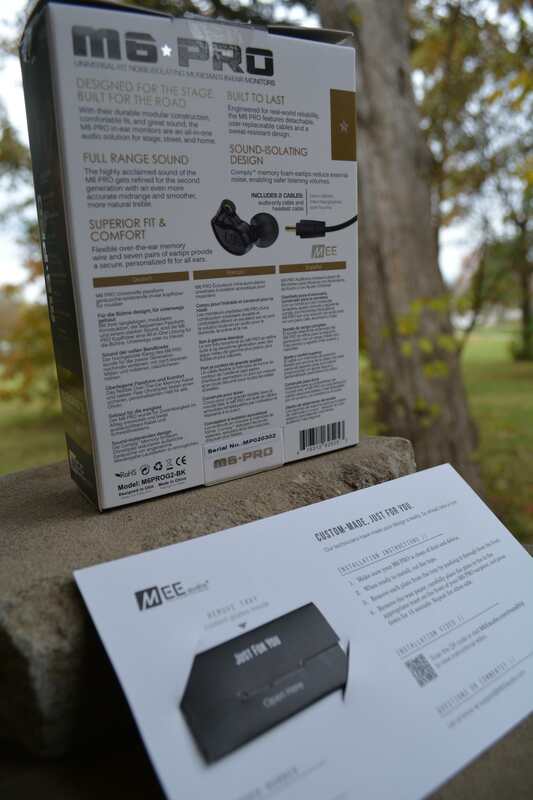 MEE Audio products have always come well equipped with accessories, and not to the detriment of the sound. Putting on the personalized plates was straightforward with detailed instructions. You really cannot bugger it up unless you try really hard. And if that is the case, then you should really be focusing that negative energy towards doing the positive! Fit-n-finish is quite good for the two-shell design. Seams match up well, plus you can see the inner workings to a point. And as mentioned, the special plate goes on without fuss and looks superb. I would highly recommend this add-on, since you can do pretty much anything within reason; personalizing your critter. Very cool design. The included cables do promote some microphonics, and this may be a bother when working out, but for normal listening I did not find it to be bothersome. The cable can tangle, well really coil would be a better word, but when kept in the very nice carrying case wrapped for a bit the M6G2 cable will hold its shape upon use. And both cables (mic and no-mic) are built tough so they will last a good long time and under tough conditions. With an embarrassment of accessories, it seems that MEE Audio has yet again raised the bar. 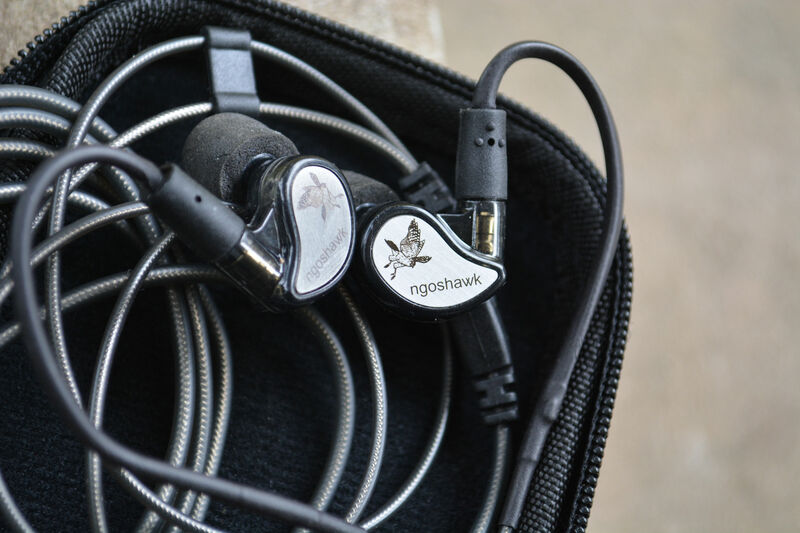 First, with the Pinnacle P1 they brought down to near-audiophile level a sound not heard in the sub $200 market. Now, they include a pretty detailed manual, numerous tips (silicon & Comply), and that extra cable. Speaking of that extra cable, it has a mic/play/pause for phone use which works quite well. I also like the tactility of that cable more than the regular cable, so that would be (and is) my choice when working out. A very nice collection with which to start. All well and good, but how does the M6G2 sound when comparing it to the first gen? As mentioned quite often with movie sequels, the second iteration is not as good as the first. Think any Dumb & Dumber To, anything past Rocky I or Police Academy I, and you get the idea. The above mentioned were simply horrible and I pity anyone who wasted their hard-earned dollars on those “movies”. The same can be said of audio items, to an extent. Sometimes those sequels change the sound signature for problems, which may not exist. Other times, the changes are to “improve” upon perceived deficiencies. Then there are the case(s) where the company wants to improve upon a successful unit. In the case of the M6G2, the sequel falls somewhere between the second and third choice. The good thing is that the company thought to make sound signature changes based upon what THEY thought were sound deficiencies. In talking to Mike, I would agree with the assessment that those changes came about as a result of a “hot” upper mid, and too much treble “bite”. I like my first gen M6 Pro, but that upper reach can and does become fatiguing after time. I reiterate what I stated above to show that the company HAS made improvements and I do approve of those changes in sound signature. Switching between the QP2R and the M3s, I was met with a nice mix of more neutral (QP2R) to that warmer signature sound of the Shanling. To me, while the QP2R is excellent, that is more DAP than the M6G2 need. So, the Shanling received a bulk of the time, as well as an M0 I had on hand at the time. The pairing was very good, providing a wide sound stage, slightly above average reach of bass, with a bit more quantity of bass and good vocals. Bass: As for that bass, there is a good quantity of bass, but not an overabundant amount. There is no mistaking this for a basshead IEM. Bassheads cousin, who might appreciate the quality of bass over quantity would be a more apt description. Better control of the bass than the first gen, as well. Full of a richness belying the price, it is good solid bass. Listening to Willy Nelson’s Sittin’ On Top Of The World, the bass guitar is present in the right amount. Supporting the gravely effervescent of Willy’s voice this sounds right. As a result of that bass quality, there is no bleed into the mids, which are slightly behind center. This allows vocals to be brought forward a bit, which can help when you really want to hear those vocals, such as Steve Walsh (wow, just wow what an athlete and signer) in Kansas’ Away From Me. There is no mistaking that all are there to support Walsh’s voice, but he sings in such a way that he does not trample on those in support. A melodious mixture of song, guitar, keyboard and viola make Kansas great. And an average IEM can make them muddy and incoherent. This is not the case with the M6G2. All meld well together. And it is here that the big change in sound changed the slightly harsh M6G1 into a very viable option at this price point. As for that harsh upper end as well, the treble has had a slight leash put on them. The last thing one would appreciate is a wonderful sound signature let down by one end or the other being overdramatic or so overwhelming that an otherwise fine section might be overshadowed. Too much treble is harsh and overreaches the desired effect. On the M6G2, that taming continues, but not to the point where those treble sounds become weak, anemic or limp. No, the M6G2 can still provide very good treble sound. From the support clash of cymbal, to the higher end of female vocals and trumpet the sound rings true. One would not mistake this for being artificial in any way. So far so good. Instrumentation can be separated fairly well (it was on the previous iteration as well). Using one of my favorites, Ziggy’s Lighthouse, I listened for each instrument and placement. It was quite good, with little congestion. Support guitar on the left, drums slightly off-center to the right, keyboard in the middle, lead guitar in the center as well. The female vocals on this song are something to behold as well, and they enveloped my ears upon entering the fray. This is among the better separation of instruments in a dedicated workout IEM of late. The second gen definitely has something going for it. 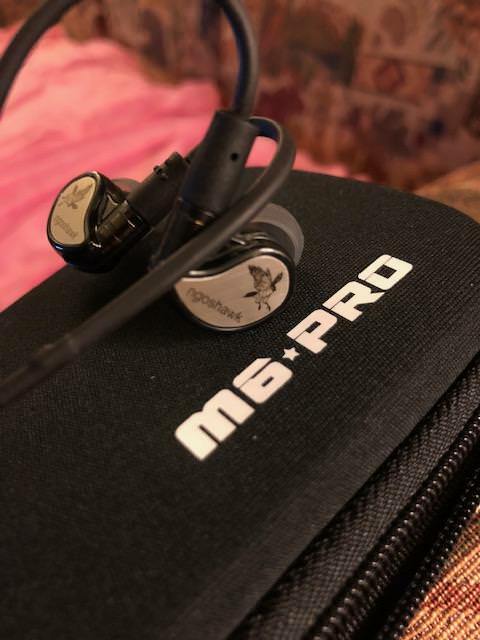 MEE Audio M6 Pro Gen2 ($59.99, with custom plates) vs MEE Audio M6 Pro Gen1 ($49.99): The intent was to upgrade a current neo-classic of MEE. Gen1 was my first foray back into the portable head-fi world along with the excellent little Dunu Titan1. Those were both quite good, but I eventually (unfortunately for my wallet?) moved onward and upward. I still occasionally pull the first gen’s out for comparative purposes, as I did like them at the time. And this was the real reason for the comparison between the two generations. The second gen definitely corrected the main “fault” of the first, smoothing out a brightness, which became fatiguing over time to me. I liked the first gen for working out, as that added brightness helped with isolating me from all other things, but after about an hour it did become fatiguing. Happily, the second gen has none of that with luscious mids that peak is gone. And MEE kept the bass of the first, adding as bit in depth and that richness of which I spoke of earlier. Gen2 wins. Not really a far comparison as both are meant for different usages, but still we do. The bass of the KZ took me away upon first listen and it still does. I like it a lot. Others have told me there is a better KZ model to judge, but I do not have that on hand at this time. And that is all right. The KZ is easier to drive as well. The mids of the KZ are good, but I give that edge to the M6G2. Those smoothed out mids are quite scrummy as Mary from the original British Baking Show would attest. Both of the contestants here are good, even at their price point. So, choosing a “winner” and one who has to go home (go watch British Baking…) is kind of pointless. I just wish I had that chocolate tiered cake to eat while I judge. So, of what are we left? Not much else. Go out and buy one. This is a worthy second gen to the first, and yet again upholds the tradition of MEE Audio and their penchant for surprises. They surprised the sub-$200 market with the Pinnacle P1. They again surprised with the P2 (more affordable and again “modified” some of what the P1 wrought. 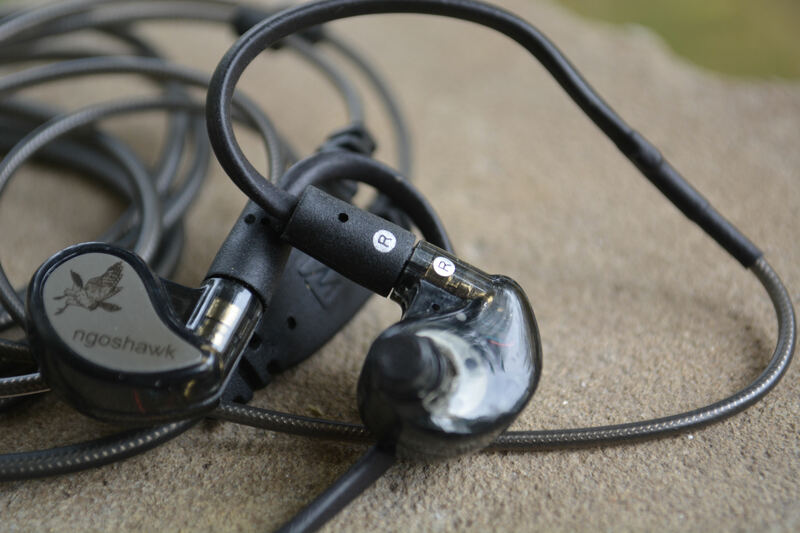 Their stable of affordable workout IEM’s highlighted by the first gen M6 Pro; but now laden with many examples. So, it is a natural step to take the first gen of the M6 Pro and make it better. And they did. As I finish this, Coldplay’s The Scientist lays down for me all that is well and good with the M6G2. Solid bass line, open sound stage just beyond one’s ears, and those mids. Those mids are worth the price alone in my humble estimation and they hit the proverbial homerun with this upgrade. The M6G2 will stay in my rotation as a result, and I consider this the best I can offer. I will continue listening to the M6G2, and it will be good. A special note to the synergy wrought between the M6G2 and the Shanling M0. I had one on hand for a good bit of the test, and I must say that of all the DAP’s I used, this was the best pairing (yes, I enjoyed it more than my QP2R and Opus #2). A happy perplexing smile came across my face with that synergy. For less than $200, you would have pretty much your ideal workout/ultra-portable set up and be perfectly content. Plus, you would not be drawing attention to your gear, plus know that it would sound better than most likely 75% of what is used on your commuter route. I thank Mike and MEE Audio for their quick response (much quicker than my review) and their willingness to work out the kinks of my custom plates. They…are…gorgeous…A fitting end would of course be 10,000 Maniacs MTV Unplugged version of These Are Days. Happy, upbeat, and Natalie’s sensuous voice close me out with this, and I am happy. Cheers, all.